This item is made from Balau Hardwood which is rated similar in strength and durability to Teak Hardwood. Balau Hardwood is an excellent wood for use in Patio Furniture due to its high density and naturally oil rich composition both of which contribute to the longevity and durability of products made with this Hardwood. Enjoy every second of outdoor living on your patio or deck when you set up this teak wood dining set from International Caravan. The butterfly-leaf extension lets this outdoor dining set keep its small footprint until you need to seat extra guests. Then the hidden extension expands to give everyone a place at the table. I ordered this dinning set March 14 2012 after I thought I had done "enough" research. I looked up the wood it was supposedly made out of, I questions about shipping and what if it were to fall apart... I even ordered the five year protection just in case. It came very quickly and was not damaged. It didn't take long to put together and was easy. Took my husband and I about an hour to hour and a half. The color was nice and the quality looked good. Fast forward about 6 weeks since being assembled. It has been rained on two or three times and has some exposure to a lot of sunlight. It has been abnormally hot for OH. With that being said it is not experiencing any more or less weather than other parts of the country and it is supposed to be made out of better wood than teak... A few of the chairs are starting to split and one board on the table. This product would not last a year without being stored inside. It appears that I will being having a difficult time getting the items replaced. I would think twice about ordering this set. I am EXTREMELY disappointed as I have waited a long time to find a wooden patio set that I could feel ok about spending money on... For what I paid I could have bought a metal/aluminum set three times over! I gave this furniture a "good" rating and not excellent because one of the chairs that we received had a crack down the leg that would not be usable for an extended period of time. I contacted Overstock and they sent a replacement chair so that when the other one does break we will have a replacement ready. 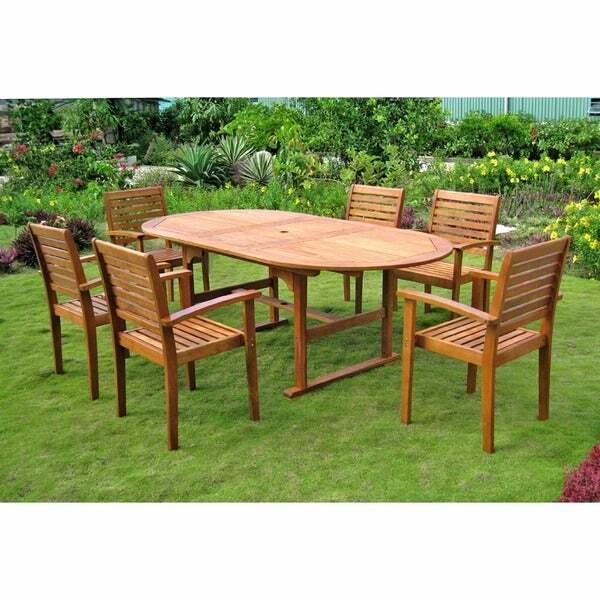 The wood seems very durable and is comparable to Teak wood which is much much more expensive. The extension in the table is easy to use and seats 6 very comfortably. We have been using the furniture mostly without pads and it is quite comfortable without them. I would recommend this product even though one chair had a crack. I have a feeling that this furniture is going to last a long time. Not hard to put together but it's pretty heavy because the wood is so dense. We LOVE the set. The look was just what we were after and we've been pleased with it. It would be nice to be able to use the umbrella hole without the leaf extended but, not that important. What is REALLY DISAPPOINTING is now that the set has been on the deck for just 3 months (late April 2012), on of the slats in the table top has warped and there are small cracks forming along seams and on the chairs. While this is Atlanta and it does get hot and humid, Balau wood is a dense tropical wood and the set was made in Viet Nam. That's why we chose the set ! Based on the research we did, we certainly didn't expect that after paying over *** on a set made of Balau that it would be deteriorating after just 3 months on a deck in Atlanta, and not all of them hot or humid !!!. We are using this set as our primary dining set. We like the style and it fits in our Florida home very nicely. Great, sturdy table and chairs. Easy to put together for two people, plus we had a larger wrench than the small one included. Lots of compliments. We keep it covered when not in use. Also, standard chair pads fit it nicely. I only wish the umbrella hole was also able to be used when the table is small. This outdoor setting was exactly what my husband and I were looking for. It is beautiful and well made. It was easy to put together, although that took a little time. MISSING PARTS - FAIR CONSTRUCTION. Sorry, I can't get over spending 2 hours putting this stuff together to find that my last chair doesn't have the necessary hardware kit. REALLY? Of course one of the types of nuts is not available at any hardware store or big box store. One CS rep said you get what you pay for - in this case its true. Also, make sure you have a drill with a hex bit to assemble the table. You will be incredibly frustrated otherwise - screwing 3" wood screws into this wood with a hex wrench is a joke. Also chairs are a little small - I am 6'3 but they are not big comfortable chairs. The wood is solid but that is the most positive aspect of the package. Now I 5 chairs - great. Will see how well Overstock remedies this situation. I've had this for a couple years and I'm about to throw it away. When it arrived, completely unfinished, I lovingly finished it with high quality weather proofing stain and varnish to help protect it from Florida weather. Less than 2 years the chairs disintegrated and I had to throw them all away. Now going onto 3 years and the table is warped, splintering, and about to hit the garbage pile. Yeah south Florida is harsh but for the cost (I paid $$$$ I would expect it to last longer than a couple years. Bottom line, don't waste your money. The table has a nice look, however the finish was terrible! The chairs are uncomfortable. Overall, a pretty cheesy ensemble. "Does it have a hole for an umbrella? " Yes, this has a hole for an umbrella. "What is the weight limit on these chairs?" Unfortunately we do not test the weight limit of products. "Can you purchase this table & 6 chairs without arms?" "Can the chairs push under the table completely?" "Can you order extra chairs?" Thank you for contacting us fencer1234. Yes, here is the SKU 14648250. Please let us know if you have any further questions. "DO the chairs stack for storage"
"What size cushion would fit the chairs best?" A cushion that is 40x60 would best fit this chair.